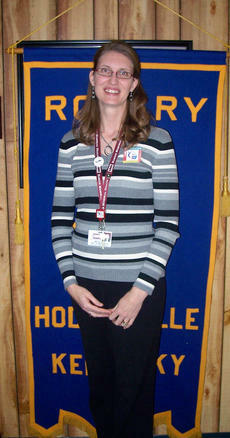 Michelle Murphy of Hardin Memorial Hospital was the featured speaker at Thursday’s Hodgenville Rotary Club meeting. She spoke on the expansion of the hospital in the community and the effects of Obamacare on the hospital. The meeting was called to order by President Billie Shahayda. Present were 16 members: Virginia Allen, Delores Bale, Janice Bowen, Julie Devore, Exie Elliott, Ann Flanders, Emogene Gardner, Mary Lois Hornback, Clovis Johnson, Norma Jean McDonald, Martha Owen, Mary Lou Owen, Shahayda, Linda Simmons, Della Thomas and Patsy Thomas. The South Fork Area Homemakers met Feb. 21 at the LaRue County Extension Office. Ashley Reding of Homestead Family Farms in Howardstown was the featured speaker at Thursday’s meeting of the Hodgenville Rotary Club. She spoke to the club about how she became involved in farming, her daily routine at the farm, and about CommonGround. 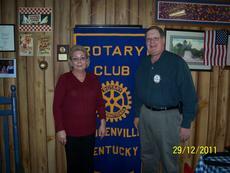 She was the guest of Rotarian Alex LaRue, left. The Young Professionals of Hardin County will have a luncheon noon Feb. 15 at The Historic State Theatre in Elizabethtown. Cost is $7, lunch catered by Shoney’s. Yearly dues are $40. The club offers networking opportunities. For more information, contact Leanna Milby at leannam02@hotmail.comor 270-234-4506. Diana Leathers, left, with the LaRue County Health Department spoke to the Hodgenville Rotary Club Jan. 26. 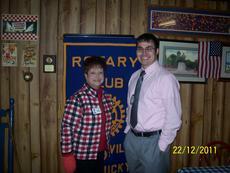 She is pictured with Rotarian Adam Gordon. Iris LaRue, left, director of The Lincoln Museum, was the featured speaker at the Dec. 29 Hodgenville Rotary Club meeting. LaRue was the guest of Rotarian Bill Justice, right. Cathy Williamson, left, of the Better Business Bureau was the guest of Kyle Williamson and featured speaker at the Dec. 22 meeting of the Hodgenville Rotary Club. 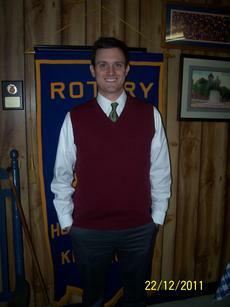 Attorney Tom Claycomb is the newest member of the Hodgenville Rotary Club. He was inducted to the club on Dec. 22 at their weekly meeting at Paula's Hot Biscuit. He is working with Robert Claycomb in general law practice.